Open by event and appointment. 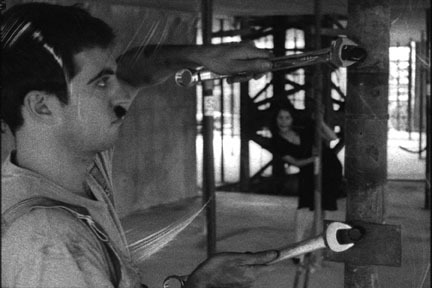 (Post) Modern Times (2006) was shot on 16mm black and white film and hand processed. It has been transferred to video and formatted for use in Isadora: real time video manipulation software. The software is capable of responding in various ways to sound frequency and volume. In addition hardware is used to convert pitch to midi note information, which Isadora uses to trigger the playback of each individual shot. Working closely with the composer of the score, the filmmaker then was faced with the task of making the formal quality of the music allow for the film’s narrative to be expressed. Certain shots are associated to a particular note, and then the composer takes this relationship into account while scoring the film. Some notes might be played repeatedly, while others should only be played once and at particular points in the performance of the film. This structure allows for both improvisation and experimentation while maintaining some semblance of the narrative arc of the film. The concepts of the edge, or periphery, and those of codes, or text, are integral to postmodern cultural theory and can be seen influencing a broad spectrum of our contemporary life from art to philosophy and on. These concepts become manifest through an obsession with surface, decentralization, and an acceptance of many truths as opposed to a broad interpretive schema. We can particularly see these ideas here in Vancouver – from our historical positioning as a city on the frontier to the preoccupations of our current urban planners and developers – this is a city of multiple voices chattering in a dispersed cultural landscape. However in Vancouver, as in many other North American cities, these tendencies haven’t manifest themselves in the kind of grass roots, social and political activism that might be seen as an appropriate response to the collapse of modernism. Concepts of overarching cultural truth typical to high modernism have merely been replaced by rampant consumerism. The many varied voices of postmodernism have become innumerable ways with which we might entertain ourselves into a state of cynicism and malaise – further alienating communities from mechanisms of change. As such we might wonder whether our most contemporary cultural practices are an appropriate response to the failings of modernism. Riffing on the conventions of silent cinema, (Post) Modern Times examines one of the era’s masterpieces – Chaplin’s Modern Times – in the context of these contemporary cultural practices. The film responds to perceived shortcomings of postmodernism by exploring an integrated relationship between music and cinematic structure. (Post) Modern Times teleports the two main characters from the Chaplin film into the midst of a contemporary Vancouver edge development. Here we find the Factory Worker, (as played by Chaplin) still suffering from the convulsive twitching caused by his physically repetitive work. Indeed, for the blue-collar worker, not much has changed in this new, postmodern world – he remains a fleshy, vulnerable cog within the brutal, capitalist machine of mass production. However now there is the added threat of emasculation as he is also being stalked by his former love the Gamin. Intertitles comment on the relationship of the two characters as well as the relationship of the piece as a whole to contemporary culture. In fact, the narrative itself shifts and breaks down as the montage of images varies from performance to performance. The score, played live in the cinema by Vancouver’s John Korsrud and Ron Samworth, edits the film in real time through pitch recognition software. Additional video treatments are similarly controlled by volume, rhythm, and sound frequency. As such the musicians have a hand in the construction of meaning within the film. As they come to understand that certain notes trigger particular shots they tend towards a musical/editorial meaning of their own idiosyncratic design. The challenge for the filmmaker is to enable a narrative absolute using individual shots like signs – signs that can be seen in almost any order and still communicate an idea or story. As such he in some ways performs a function similar to that of the corporate capitalist in our postmodern world – he allows for varying expressions of discourse but the end result is always the same.